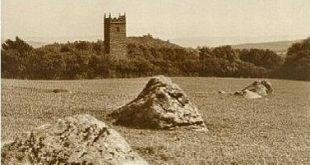 It’s always said that you never appreciate the things that are in front of you and having once lived just outside Chagford the Market House, AKA ‘The Pepperpot’ is a fine example. Until I came across a newspaper report of 1862 I never realised the building held so much history, some of which is very tragic. Certainly the next time I visit the town I will pay much more attention to the place. The building we see today is built on the site of a several former market houses the earliest being first recorded in 1574. At this time not only was it a market house but also a courtroom where the Stannary Courts were held. During the fifteenth century Chagford was known as the ‘Market of the Moor’ because along with the normal markets Chagford had been granted four fair days. These occurred on the feasts of St. George, St. Michael, St. Luke and Our Lady. During the latter part of King Henry VII’s reign all proceeds from the markets and fairs went to the Guild of St. Katherine. Upon the King’s death the Guild ceased to exist and in all probability the proceeds were then handed to the Lord of the Manor who in 1564 sold these to the parishioners of Chagford for £20. So what with the courts, the markets and fairs the little ‘Pepperpot’ would have been at the epicentre of Chagford’s main activities. Although there is some question about the date of this event in Westcote’s book he noted that; “Now are we come to Chegford, alias Chagford, the fourth place we are to speak of where a tin-court is held; which was very lamentable the 1st August, 1616, for the court held that day, the chamber wherein it was kept stood upon pillars, and those decayed, and the assembly at that court greater than ordinary, the pillars and timber cleft in sunder and the walls fell in, and the steward, a gentleman of good descent and a counsellor-at-law, and nine others were suddenly slain; many more had their arms and legs broken, being covered in the timber and stones : but that which seemeth most strange, a little child was taken up from among the slain not anything hurt ; which is not to be slighted, though not to be made a wonder: for we know who saith that their angels do always behold the face of our Father which is in heaven.” p.430. Over time the Market House fell into disrepair, so much so that it became known as ‘The Shambles’ and was eventually demolished. It was in 1862 that building work commenced on the new Market House. On the 2nd of August 1862 the Western times printed a report of the official ceremony which took place to mark the advent of this event. It was stated that Mr. H. Williams was the architect who designed the new building which was to be built by the contractors – Messrs. W. Stone and T. Ball. In a hollow of the corner stone Mr. G. W. Ormerod placed a glass tube which contained photographs of the old Market House along a role of the parish officers and the building committee. A metal plate was then placed over the time capsule. Mrs. C. Hames then spread some mortar onto which the stone was lowered to the accompaniment of the local band playing the National Anthem. The Rev. G. H. Hames then applied the square to the stone and proceeded to address the assembly. Following the usual votes of thanks the Rev. then said that he; “considered that when finished the building would not only be ornamental but useful; that it would comprise all the requisites of a Market House, and, besides those, a room for parish meetings and a library institute, which if properly carried out, would promote an intellectual taste among the young people of Chagford and teach them that there was a better and pleasanter way of passing the long winter evenings than in wasting their precious time in the public houses,” – dream on vicar! In 1894 the Market House became a property belonging to the Chagford Parish Council who then in the 1920s sold it to the Okehampton Rural District Council and today it lies within the remit of the West Devon Borough Council. During fairly recent time the Market House has undergone various stages of modernisation and renovation, the first being in the 1970s when the interior was modernised. Then in 1984 the structure underwent and extensive renovation which included the roof being taken off. Barber tells us that when this happened hundreds of pigeons eggs were found in and around the roof’s floor space, p.23. It was around this time that the Market House gained the name of ‘The Pepperpot’. The British Buildings website describes the present building as an; “octagonal market house facing south-east. The rear section has always contained public lavatories either side of a small room. The front was originally open but is now filled with small shops. Front door to central stairwell up to a first floor room in the roofspace. Exterior: the front side contains a large 2-centred arched doorway with chamfered surround. Its head is filled with an iron grille. There is a gable above containing an uninscribed plaque. The flanking 2 sides have now been filled with shops. The corner posts between has a battered plinths and soffit-chamfered caps. The lavatories each have a narrow 2-centred arch doorway and the rear room contains a large 2-light window with Decorated Gothic tracery. Pyramid roof has gabled dormers containing arch-headed fixed pane windows and, at the apex, a louvred lantern topped by a narrow spire and wrought iron weather vane. Barber, C. 1994. The great Little Chagford Book. Exeter: Obelisk Publications. Hambling, P. 1995. The Dartmoor Stannaries. Newton Abbot: Orchard Publications. Westcote, T. 1845. A View of Devonshire in MDCXXX. Exeter: William Roberts. Interesting. I have visited Chagford twice and plan to return this summer. It is a beautiful and interesting town. I understand from my heritage books that the Whidden/Whiddon family lived there from circa 1300’s – 1600’s and were revered in the area. If you have or know of information/books/articles I could read about my family, would you let me know as I am searching more deeply into my heritage.